Five years ago, the only reason most people would find themselves in Bushwick is if they slept through their stop on the L train. That’s far from the case today -- the graffiti-splattered, loft-filled ‘hood has completed the transition from quirky artists' community to mainstream culture hub, for better or worse -- and the eating and drinking scene has never been stronger (dining options are the only thing increasing faster than rents). Even if the restaurant that first put Bushwick on the foodie radar, Northeast Kingdom, closed its doors and turned into an Artichoke Pizza, the arrival of some serious kitchens has more than filled the void. 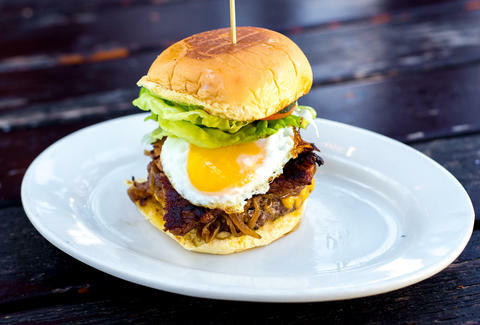 These are the best places to eat in Bushwick. 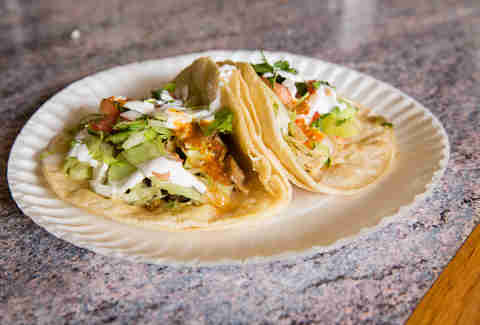 There’s no shortage of quality taco trucks or torta-slinging bodega counters in Bushwick, but Guadalupe Inn introduced a new standard with a refined, modern menu that exudes Mexico City influences. Chef/owner Ivan Garcia -- also behind Williamsburg’s Mesa Coyoacán and Zona Rosa -- hails from Mexico’s capital, and showcases his skills with a lineup of theatrically plated sharable dishes and agave-based drinks. Start with the octopus: three massive, tender tentacles on a bed of spicy plum mole cut with peas and potatoes. 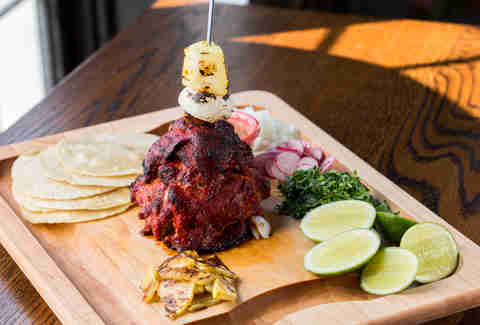 The must-order main is the Trompito al Pastor for two: a heaping mound of sliced pork, marinated in pineapple and guajillo chile, that’s stuck with a wooden spear on a giant cutting board next to a pile of corn tortillas, and toppings like cilantro, raw onion, and chile de árbol. The showy presentation more than fits the vibe of the dining room -- with leather banquettes under a modern chandelier (and a disco ball), plus a performance stage. 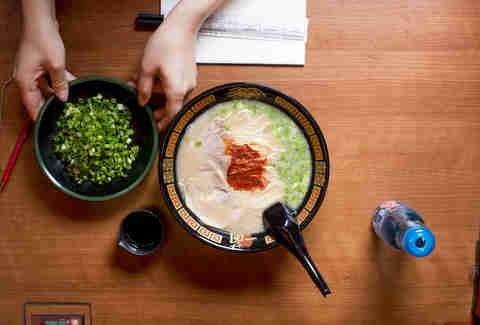 You won’t spot a single sofa in the eatery that dubbed itself “Bushwick’s Living Room,” but the American comfort food and easygoing attitude is enough to make you feel at home. If the place feels like it’s been around for awhile, it’s because in some ways it has -- it was once Life Café, offering table-service a decade before the “cool kids” came to town. Today, it’s the kind of place that appeals to both comfort eaters and health freaks; on the same menu you’ll find a BBQ sauce-drenched Cowboy burger crowned with oversized onion rings and a far healthier Dragon Bowl with tahini-drizzled brown rice, avocado, eggplant, and zucchini. Even though this is a casual spot, it still has serious drinks: Bartenders are equally adept at cracking open cheap Rolling Rock tall boys as they are mixing up an Aviation cocktail. It feels like you’re in on a secret when you enter the discrete Kávé Espresso Bar, a cafe and workspace that would appear to somehow attract only well-dressed, impossibly beautiful people. A baby grand piano is the first thing you see, and you’re likely to find an MFA candidate banging out his New Age interpretation of Beethoven’s Symphonies as the caffeinated crowd politely claps. It’s a fitting soundtrack to carry you to the coffee counter for a cold brew or French-press cup made from organic, free-trade, locally roasted beans (naturally). Vegan sandwiches and gluten-free baked goods, like “whoopie” pies and blueberry-buckwheat muffins, cover those who don’t opt for a mini-baguette with brie or goat cheese. Roberta’s is still the most talked-about Bushwick restaurant, and for good reason: The wood-fired pizza is some of the city’s best. Why else do you think the Morgan L stop is flooded with doe-eyed European tourists so eager to wait on lines that still wrap around the corner? The Neapolitan-style pies -- which are chewy, soft, and dotted with black char-bubbles -- have been drawing everyone and their mothers since the place opened in 2008. Go for The Spekenwolf, topped with speck, roasted cremini mushrooms, red onion, and dried oregano; or the bold salty-sweet flavor of The Bee Sting, with spicy sopressata and crushed tomatoes countered by surprisingly balancing honey drizzle. Too often hype disappoints, but at Roberta’s, the hype is all too real. Le Garage’s elevated New French fare is a testament to a growing taste for upscale food in the neighborhood, even if you may pass an overturned trash can or two on your way there. Still, the restaurant is housed in a bright yellow converted garage space (in true Bushwick fashion), with a tasteful Art Deco-accented dining room hiding behind the hard exterior. This is the kind of place you’d want to bring a date (or maybe your parents when they’re in town). You’ll get a taste of Southern France in a fried panisse starter: a peppery stack of flash-fried chickpea-flour sticks with rosemary yogurt for dipping; and don’t skip the house-made foie gras, served in two petite discs with a coarse-salt shower and sweet orange compote. 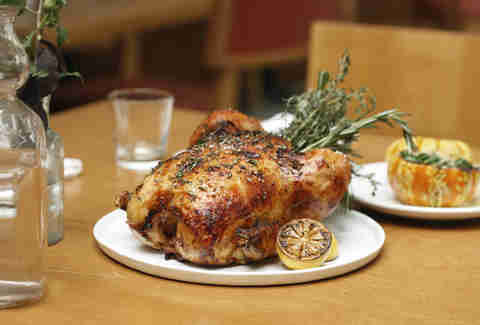 The roast chicken for two is another must-order, ceremoniously presented in all its golden and rosemary-stuffed glory, before it’s ferried back to the open kitchen to be carved and joined by a lemongrass-sweet potato mash. Whatever you choose to order, finish with the textbook crème brûlée, which goes down nicely with a mini personal French press, to complete the experience. The red neon sign above this little pizzeria/bar is a beacon for anyone stumbling home after a night of drinking. 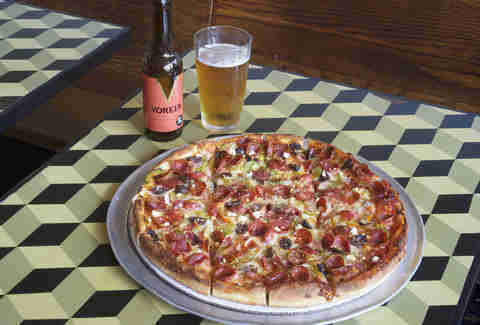 Pizza and beer are served until 4am (except on Sunday, but even then the cut-off is midnight). But it’s not just a stop on your way home -- Archie’s is a destination in itself, cultivating a vibe that makes you actually want to sit down and stay, with good music and charming tattooed bartenders begging you to kick back. The pizza is thick and more New England-style than your typical New York corner slice -- that means girthy, pan-baked pies with doughy crusts that are sturdy enough to handle a heavy onslaught of toppings. Fat sub sandwiches filled with crushed meatballs or saucy eggplant Parm and cheesy cast-iron-baked pastas are also available, should you need something extra. Is it a big deal that Italian restaurant Faro was awarded a Michelin star for the 2017 guide? Yes. But it’s no surprise considering that “locally sourced” is not a mere cliché here: staff actually mill the organic flour used to make house breads and pasta. 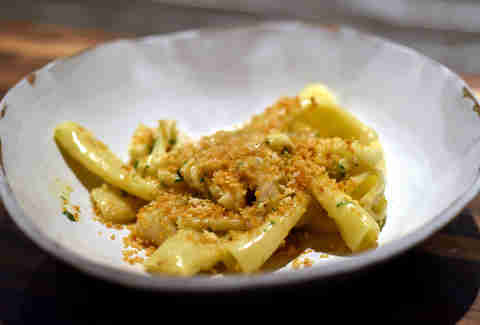 Chef Kevin Adey -- who sharpened his knives at Le Bernardin before working at Bushwick pillar Northeast Kingdom -- has designed a menu broken into “Earth, Wheat, and Fire” sections, but his pastas are what impress the most. His seasonal preparations are elegant, from corn gnocchetti with quail and rosemary, to a thick, egg-y chitarra tossed with crab and sea urchin. If you’re willing to spend $85 per person, spring for the tasting menu. But if not, it’s worth coming even for just a single ceramic plate of his magic pasta à la carte. Tina’s has been serving comfortingly greasy diner food since it opened in the early 1970s -- making it a rare holdout of the Old Guard in a ‘hood that’s seen a lot of change. The place looks just like a no-frills diner should: Tabletops are made of fake wood, fluorescent lights shine overhead, and dated faux-wood paneling lines the walls. The food mimics that feel as well -- think dirt-cheap stacks of pancakes, egg sandwiches, and bottomless cups of burnt coffee. The curious operating hours (usually 3am-3pm) originated back in the day to accommodate workers from the Boar’s Head factory across the street -- who still come to eat in the wee hours, by the way -- but such a wonky schedule seems to accommodate hungry, young partiers on their way home from a rave just fine, too. Never change, Tina. Pakistani barbecue mecca BK Jani takes New Yorkers’ beloved halal street cart food to destination-dining levels. Hand-written signs covering one wall heap praise on the lamb chops, and you should heed them. Served by the half- or full-rack, they come out tender, spice-rubbed, and fanned out on a paper plate. If asked if you can handle “spicy,” say yes. Of the restaurant’s notorious heat levels, owner and grillmaster Sibte Hassan says, “I could lessen it, but that would just muddle the flavor.” Don’t worry -- the accompanying mint chutney is the only cooling agent needed. 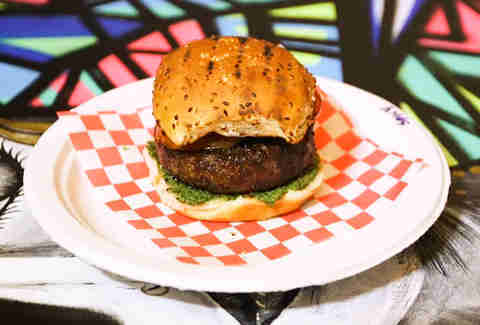 All the meat here is worth trying -- from a spicy and citrus-y halal burger to juicy, charred seekh kebabs. The dramatic mural splashed on the face of Forrest Point may change from time to time -- it depicted a regal elephant before turning into a bookshelf -- but one thing is constant: The eat-in patio has an adult-playground-meets-bohemian-fantasy vibe that makes it the best place to eat and drink outdoors in the area. Created by the team behind Boulton & Watt and Ella, this corner-lot restaurant looks and feels like a very Brooklyn response to those Manhattan haunts. Global, modern small plates make up the playfully wide-ranging menu, with standouts like a trio of wasabi-guac-topped tuna tartare tacos and a braised pork belly sandwich with Sriracha-aioli. Translucent green plastic hangs partially over the patio, casting a colored glow over the space, where you can plop down in mismatched garden chairs that are cuter than they are comfortable. Still, the best perch is the hanging bench swing, which is perfect for leaning back with a cocktail like The Bushwick (gin, Cynar, vermouth, St.-Germain, and orange bitters). Bunna Cafe set the standard for vegan Ethiopian in New York when it transitioned from Smorgasburg pop-up to Bushwick brick-and-mortar in 2014 -- mostly because the city hadn’t had one prior. The smell of roasting coffee beans and spice hits you upon entering, which shouldn’t surprise anyone, considering Bunna takes its name from a centuries-old Ethiopian coffee preparation ceremony. 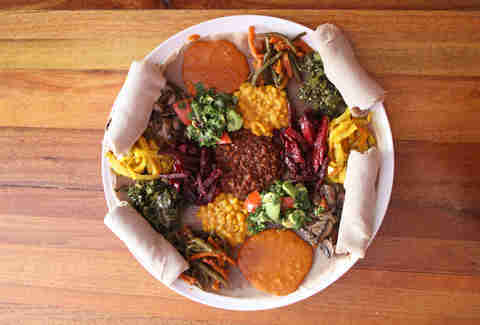 For dinner, come with a friend to undertake the Feast for Two: nine savory vegetable and legume dishes scooped onto a large injera pancake -- a spongy, sourdough Ethiopian flatbread that serves as both plate and utensil. Two types of lentils serve as a filling foundation to the communal meal -- a red one spiced with berbere, and a softer yellow one made with turmeric. 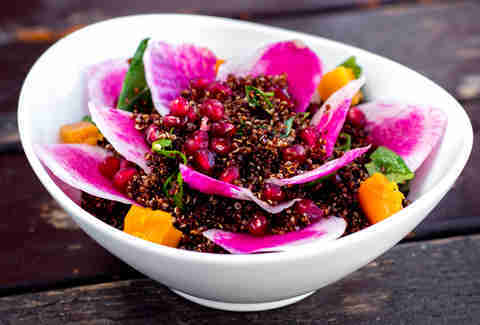 Other toppings run the gamut from diced pumpkin cubes to light kale salad. Rip off a hunk of injera, scoop your veggies, and ferry the whole thing to your mouth with your hands (it’s the only way to eat it). Grilled cheese is a holy thing, and at The Wheelhouse, elevating the staple to gourmet levels is... well, their whole wheelhouse. Sure, you can build-your-own, but one of the speciality sandwiches, made with bread from Balthazar Bakery, is the way to go. The best by far is the Panavia Tornado -- hot smoked mozzarella and provolone oozing around pickled red peppers and bits of pancetta on a basil-pesto smeared, balsamic-drizzled, Parmesan-crusted ciabatta roll. Whiskey-soaked pickles by Brooklyn Brine Co. make a crisp, smoky side to the gooey sandwiches. This Knickerbocker Ave seafood shack is enough to make you forget it’s not summer -- from the old-timey New England “clam shack” sign, to the ship’s wheel on the wall, to the stringed boat lights. 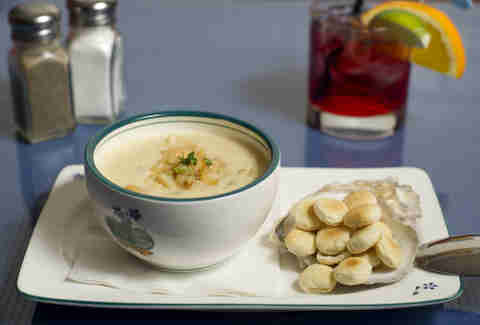 Toss back Littleneck clams and Wellfleet oysters with white wine or a draft beer. Midday menus are deep-fried and come with lots of tartar, from chewy clam strips, to haddock with French fries. If you come in for dinner, expect tried-and-true oceanic fare like pan-seared scallops, mussels, and baked haddock to be joined by an offbeat Negroni-braised octopus. Cocktails on tap, from Mai Tais to a rummy The Ancient Mariner, can be had frozen or on the rocks. Combine pan-Asian fusion with a psychedelic daydream and you have King Noodle, a neon- and tinsel-adorned spot known for unconventional flavor combinations. The ma po tofu chili cheese fries here take cross-cultural cuisine to the extreme: a bowl of crisp fries topped with spicy Szechuan pepper sauce, spoons of ground pork, and wads of soft tofu that almost melt into the American cheese laid over it. Where else can you eat fries with chopsticks? There restaurant has a history of coming up with outlandish dishes -- the Nacho Cheese Doritos-sprinkled carbonara was a past highlight -- but the fries are the most enduring (a 2015 update of the restaurant toned down the over-the-top food a bit, but kept the fries). You can pair them with mini-cans of sake, but the best idea is to opt for a flaming Scorpion Bowl cocktail. Little Skip’s is a carburetor shop-turned-cafe built for curing hangovers: If the Counter Culture coffee doesn’t save you, the sandwich menu will. The brick-walled nook caters to diverse tastes, from a hot Grilled Granny (melty cheddar with pesto and granny smith apple) to a more elegant, open-faced Norwegian, with smoked salmon, goat cheese, avocado, and lemon-honey vinaigrette drizzle. The M Train sandwich has not only the power to cure hunger, but resolve all human ailments: a monstrous helping of sliced turkey, goat cheese, pesto, honey, red onion, a hard-boiled egg, and mixed greens on wheat toast. It’s huge, thick, layered, and better when interspersed with bites of the salty, ruffled chips that come on the side. 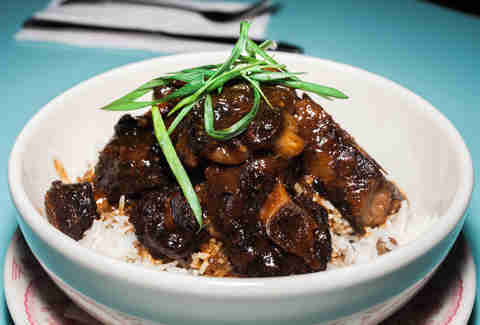 Classic Caribbean soul food gets a contemporary update at Sally Roots on Wyckoff Ave. You’re here for the outstanding Jamaican jerk chicken wings, which are rubbed in a dry spice that’s simultaneously spicy and sweet, and will completely rid you of any preconceived, Buffalo sauce-soaked notions about wings. Still, the larger island-themed menu is more than worth exploring, from shrimp-salad-stuffed charred avocados to braised oxtail over rice & peas to smoked, BBQ-brushed short rib with mashed potatoes. If you don’t feel like summer is eternal after all the tropical eats, an Everything Cocktail should get you in the mood -- combining tequila, rum, gin, and vodka into a highball glass over crushed ice with grapefruit, triple sec, and Ting soda pop. When it opened in 2014, Arrogant Swine brought large-scale North Carolina-style barbecue to a city obsessed with Texas-style. Pitmaster and owner Tyson Ho quit his finance job to turn a 3000sqft former warehouse into a spacious smokehouse, and you can smell what’s cooking inside from halfway down the block. He grills whole hogs for more than 12 hours and serves up every part of the pig: mounds of vinegary pulled pork with pepper sauce, chunks of shoulder steak with tomato dip, tender strips of pork belly, stacks of spare ribs, and rings of house sausage. You’re here for the pork, but if you’re craving something else, opt for the tremendous turkey leg -- and save room for sides like collard greens, pit-smoked beans, and waffle-pressed mac & cheese (which is exactly what it sounds like). Bunker attracted long lines for its Vietnamese street fare when it opened in Ridgewood in 2013, but now that it’s made the move to a location three times the size in Bushwick, it actually has the space to handle crowds. The hard-to-find door hides behind bamboo, but there’s nothing discreet about the brightly colored, punk-tropical interiors... or the menu, for that matter. Chef Jimmy Tu, whose resume includes Eleven Madison Park, delivers a lineup of dishes that draw inspiration from Vietnamese market eats and his own mother’s cooking. Pork skewers are wrapped in greens and rice paper, banh mi is filled with lemongrass short ribs and shallot-mayo, and fish gets fried whole before being drenched in an aromatic blend of tamarind, chili, pineapple, and kaffir lime. Billy Frierson is a Bushwick-based writer who thinks the only way to walk underneath the elevated subway tracks on Broadway is while listening to Sharon Jones and the Dap Kings. Follow him on Twitter and Instagram.